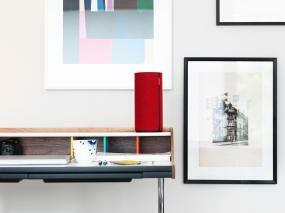 Libratone Zipp Soul Collection Portable Wireless Music System with Airplay. Mains or Battery powered - Up to 8 hours playback time. Libratone's Zipp AirPlay speaker for iPad, iPhone, iPod touch, Mac/PC and Android devices offers absolute audio freedom wrapped in fine changeable Italian wool. 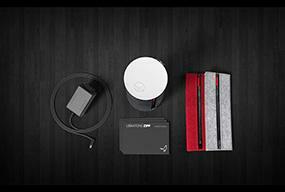 Move Libratone Zipp around your house, use it at work, or share your music outdoors. Available in two different color collections. Libratone Zipp works like an acoustic instrument filling the entire room with sound. The tweeters and midrange drivers disperse sound in different directions, reflecting it off the walls and providing 360° sound. We call it FullRoom sound and yes, it's patented. High-end components such as ribbon-based tweeters, digital signal processing and digital amplification provide premium sound. Apple Lossless technology ensures a perfect transfer from a music source to the Libratone Zipp. AirPlay connection gives you the freedom to move about as you please with your entire music library in the palm of your hand. Stream audio wirelessly and effortlessly from iOS devices and Mac/PC. Connected to a Wi-Fi network or not, Libratone Zipp is immediately ready to deliver a high-quality audio experience, anytime, anywhere thanks to the built-in battery, PlayDirect and AirPlay technology. Just remember to turn on your Libratone Zipp before you start streaming. One Zipp speaker and two extra zip-on covers. Download the app and optimize your sound experience. Feed the app with information and it automatically adjusts the sound to fit the room your speaker is in. Play your music wirelessly everywhere. Simply ensure your music source has a functioning WiFi-network and is within reach of your speaker. Apple Lossless technology ensures a faultless transfer of sound via AirPlay or PlayDirect. 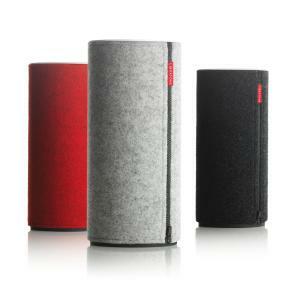 Libratone Zipp is designed to enhance the experience of Apple products. It works with iPad, iPhone and iPod touch but, as long as you have iTunes 10.1 or above, you are good to go, no matter if it's on a Mac or your PC. Stream simultaneously to multiple Libratone speakers to fill your house with sound. Control everything in iTunes on your computer. With Libratone Zipp you won't have any extra remotes lying around. Everything is controlled from the device you use.